Even the Washington Post calls FOE, "...furthest to the political left of mainstream green groups" ("From Fringe To Political Mainstream," by Michael Weiskopf, Washington Post, April 19, 1990, p. A1). But what may really steam your bean, is when you realize that an already radical environmental group like FOE was hijacked from their extremist founder David Bower by purported power players wanting to relocate FOE's original San Francisco base to Washington, D.C. to "mainstream" itself in order to get foundation grants--money used for not only programs, but salaries as well. According to Undue Influence, a sort of watchdog group that tracks money invested in--and used by--environmental movements, FOE, while only pulling in $3 million in revenue in 2000, reported expenses of over $4 million, allowing FOE to claim a loss of well over a half million dollars. Although in recent years FOE has done a bit better to break even into the black, their administration costs are a whomping 25.5% of their expenses, which includes their president's healthy, 6-figure salary (over $125,000 a year reported by Charity Navigator in 2005). By comparison, the well-known Natural Resources Defense Council's (NRDC) administrative costs are only 8.4%, or about 1/3 of FOE's ratio. FOE has also been recognized as an Eco-Extremist movement, much aligned with ideologies like Green Peace that exploit disasters for their cause. In one instance, after the Indonesian Tsunami in 2004, Friends of the Earth Director Tony Juniper told a British newspaper, "Here again are yet more events in the real world that are consistent with climate change predictions." Tectonic activity that caused the Tsunami though is well known to have nothing at all to do with our climate or global warming, but FOE found this to be another sky-is-falling opportunity to raise awareness to their cause. The only way to turn the supertanker around, and to avoid the worst effects of climate change..., is to act promptly and on a large scale. Waiting to see if things really turn out as badly as predicted will mean that we miss the last chance to ensure that our grandchildren, and their grandchildren, inherit a livable world. By the middle of this century, London will be 1 to 2°C warmer in winter and 2 to 3.5°C warmer in summer than it was at the beginning of the 20th century. By 2020, twice as many days will exceed 25°C in London each summer; by 2050, there will be three to five times as many hot days. This type of wording would make this paper a banished archive in the science realm, since these figures are of course unknowns, not established, and holding high degrees of uncertainties (something I elaborated on before here). Still, the authors fill their work with apocalyptic statements like "Growing numbers of refugees will flee from areas of food and water shortages, including many parts of Africa and southern Asia" instead of discussing how they actually arrived at figures in the trillions of dollars from climate change impacts. They do however, ambiguously discuss some of these costs, with one of the biggest expenses relating to electricity use, assuming that air conditioners will have to run harder and longer in the future. Yet the report fails to account for lower heating requirements in the winter, which would offset this cost to a certain degree. The authors also posit that agriculture would take a devastating hit, but as I point out in chapter 7 of Is it Hot in Here?--The simple truth about global warming, even the Pew Center disputes this. And a big portion of the $74 trillion cost that FOE's new report torts is the assumption that all years in the future will be like 2005 where storms like Katrina ravage coastlines. But the authors once again fail to point out that 2006 and many years like it in recent times have experienced punchless hurricane seasons. 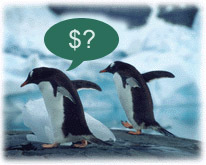 So how exactly did the FOE report conclude that global warming would cost us $74 trillion? It's a good question--one that the authors aren't exactly clear about in their ill-boding narration on the demise of world nations. Although the FOE report comprises well over 30 pages of baleful banter, very little is dedicated to the discussion of how dollar figures were derived. In the report's summary, the authors finally make clear that economic forecasts such as this "...are inevitably uncertain" and that looking into the future is "not precisely predictable." They do however give credit to where their numbers came from, pointing out that it wasn't from the authors at all, but instead from studies performed in the past by other individuals; hence, the report is nothing new, it's a mere rehash of old news, spun into a headline-grabbing and oftentimes confusing, convoluted compendium. They also don't make clear if the $74 trillion will be in addition to current spending on the issues they raise, or if these are new costs on top of what is spent today. If the two economists who constructed this report for FOE were to publish their findings in a credible, peer reviewed arena such as the journals Science, Nature, or other such publication, the headlines that made the news would have certainly been different. This work wouldn't have made it past the first editorial desk of any reliable review board. The lack of scientific rigor mixed with the author's exuberance of bias and lack of factual equality have left this report, that's all ready riddled with holes, as a propaganda tool disguised as something more. Sadly, the media can't seem to tell the difference in a day and age when it's in vogue to find anything--and I mean anything--that leans to the extreme on climate change. Our world is facing a serious issue in regards to its climate. Work needs to be conducted to find out more and take steps to improve how we treat the only planet at our disposal. Addressing this crucial issue with scare tactics though is unproductive, similar to the little boy who cried wolf, until one day, no one would listen to his cries any more. Our world deserves better; our world and all of us deserve the truth.